Sterrehof Stud has its very own distinguishing architecture, characterised by sustainability, sturdiness and atmosphere. The pyramid shaped roofs as well as the plentifully applied and now greyed oak wood from Polish production forests immediately catch your eye. When they had this stud built, Ivo and Ellen used all the horse industry experience they had gained in the years prior. They knew exactly what to do and, just as importantly, what not to do. All this has added up to a state-of-the-art blend in the facilities present, offering lots of air, light, variation and exercise for the horses, just like they wanted. The indoor school is one of the eye-catchers. It’s the ideal place to work the horses when the weather or other circumstances outside don’t allow it. The arena offers the perfect training ground for our horses and riders. We have decorated the walls with beautiful photo canvasses showing the well-known Sterrehof horses and scenic images. The foyer is also exceptional, hanging at two-third of the arena, allowing horses and their riders to ride underneath. The architect initially put our idea aside, but construction calculations proved us right. The horses and their performances can be watched easily and comfortably from behind the glass. Sterrehof Stud boasts extensive and excellent training facilities. Our riding arenas are equipped with first-rate footing. Everything is drained and we even get to train outside when it freezes. The racetrack we have put around one of the pastures turns out to work really well for the horses. Condition and stamina can be worked on with interval training, while a full, straight gallop every now and then keeps the horses happy. We also have a cage used for free-jumping young horses, comparable to the so-called couloir that KWPN uses for their stallion selections. We use it as a selection tool to ascertain how horses ‘think about’ a jump and to assess their technique. The back of the yard offers a wide view of the countryside, as well as fourteen hectares of pastures, for the horses to graze on and for gaining hay silage. We have four big sand paddocks where the horses like to roll and play in. We tried draining them but that didn’t work out, as the young horses seemed to enjoy digging up the draining pipes. 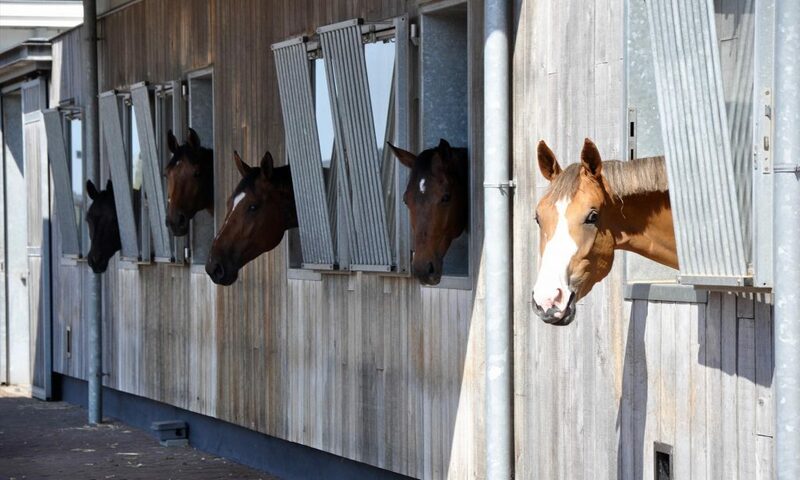 In our stables we have paid a lot of attention to the horses’ social possibilities. The sport stables’ inner walls have barred openings so the horses can see and smell each other, but not injure each other. All stable passages can be closed separately with sliding doors and an inventive height system allows for plenty of fresh air to enter the stables without it ever getting draughty. Thanks to our Flybusters system we never have lots of flies in our stables. The system is applied more and more these days, but we have had it for many years. We have all modern professional sport yard facilities, such as a tackroom, washing areas and a feed and supplements area. Our big, spacious group housing for the youngsters have long proven their function and usefulness. In front there is a coated floor. When they’re eating, the young horses stand on rubber instead of concrete, which we feel is better for the hooves. We always have one feeder in excess, so there has to be no arguing over space or feed. The front also has a wind canvas that can be lowered in case of strong winds. We use a deep litter system. We remove droppings and soiled patches on a daily basis and add fresh bedding, but leave the base untouched. The base of the bed is lifted twice a year. We have a circulating water system that prevents the water from freezing. Thanks to camera surveillance we can watch all the horses from our home computer.